Hunters Bar Infant School is a popular and successful school on a tight urban site. Despite the limited space, the school was not utilising its grounds to their fullest extent to support play and learning opportunities. Working closely with pupils, staff, and governors, we developed a strategy for the phased implementation of a series of innovative and sustainable outside play and learning environments. A range of workshops were undertaken with pupils from all years to develop a story / narrative for the grounds based around the changing seasons. The children’s work directly influenced the design of the masterplan, and all of the work was shared across the wider school community. The first phase of the design included an accessible garden, observation tower and ‘shipwreck’ benches, designed through a collaborative process and built by Handspring Design. Giant reclaimed glue-lam beams, reminiscent of the ribs of a long-lost ship, form the base for new seating for pupils and parents. New raised timber beds interlock with existing stone planting beds to create a maze of paths through the nature garden, towards a tower at the back of the garden. The children’s work directly influenced the design of the masterplan. The three storey tower sits to the rear of the nature garden, straddling a level change between the pre-school yard and the infant playground. The lower half houses a store for tricycles and other play equipment. The middle tier forms a store for the garden club equipment, whilst a hidden stair leads up to the Garden Club’s secret den. The structure is made from green oak and materials reclaimed from the demolition of another Sheffield school. 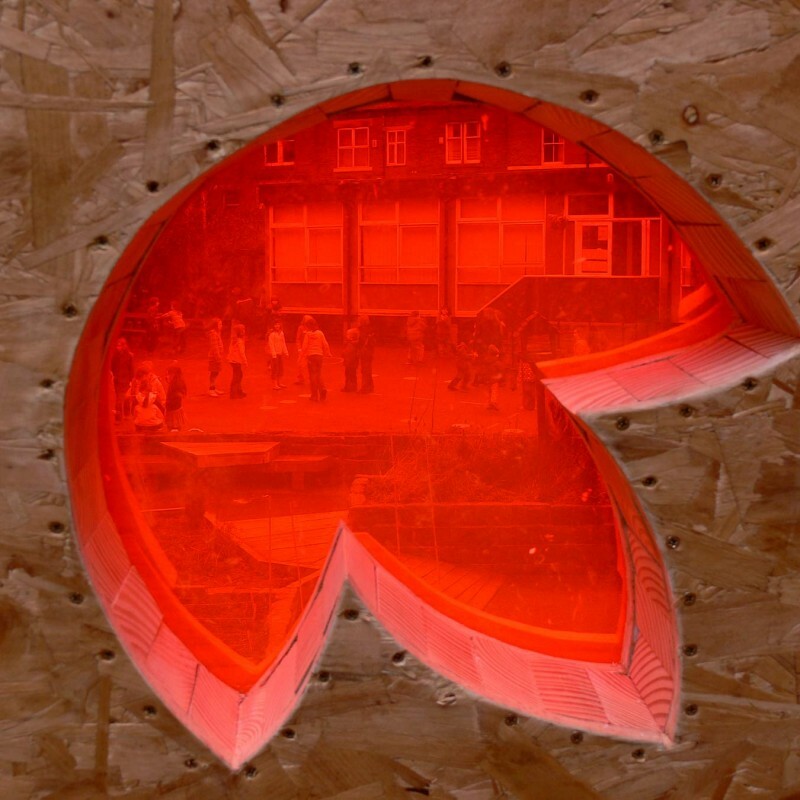 Set into the oak are flower shaped windows, fitted with coloured glass and offering stolen views over the school grounds and surrounding neighbourhood.